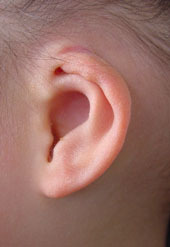 Cryptotia is an unusual condition in which the upper pole of the ear appears buried beneath the scalp skin. 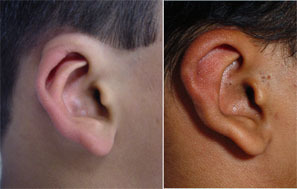 In addition the ear cartilage is often incompletely formed and prominent. Correction involves a flap of scalp skin to release the upper pole in conjunction with correction of the prominence. This is performed as a day procedure under general anaesthesia for children, or local anaesthesia for adults. A head bandage is required for several days.